Audience: Ages 5 and up. Summary: It is 1931 in a village in Cameroon. Kedi’s American teacher tells the students that children are starving “across the great salt river” because of the Depression going on in America. Kedi, who has known hunger herself, is so moved by the idea of other children’s lack of food that she tries to raise money from the members of her village to help out. Despite their own poverty, the villagers eventually give the few coins that they have. Literary elements at work in the story: Though the story is told in the third person, the reader sees the plot unfold through the eyes of the young girl, Kedi. Perhaps it would be more accurate to say that we see this story through Kedi’s heart, since this narrative is about what happens when one small person is grasped by compassion and must act on what her heart tells her to do. In a variation on traditional cumulative tales, Kedi goes from one member of her village to the next, asking each one if they have money to share with the starving children in America. Tanksley’s bright watercolor and ink paintings show the reader a young Kedi humbly but persistently approaching one after another of the adults in her life. Just as she thinks that there is no hope for this endeavor, all of the adults who originally tell her ‘no’ show up to give the teacher their coins. The final painting in the book shows Kedi embracing her mother, grateful that now her heart can sit down in peace. How does the perspective on gender/race/culture/economics/ability make a difference to the story? The setting and the characters of this story turn the familiar narrative of charity on its head. Instead of a wealthy first-world community giving of their largesse, the poor Cameroonian villagers are moved by a story of need and give generously of what they have to the poor Americans. The tale is doubly powerful because the main character is a young girl. It is the youngest in this poor village who can prompt the adults to give liberally. Kedi’s teacher tells the class that there are hungry children in a land far away. What do you think it means that Kedi’s “heart stood up for them in sympathy”? What does Kedi decide to do for the hungry children in America? Why do the grownups tell Kedi that they cannot help her? What happens at the end of the story? Why do you think the grownups changed their minds? Jesus asks us to help people who are hungry and thirsty and sick. I wonder what you could do to help hungry people? This review was written by Union Presbyterian Seminary student Beth Lyon-Suhring. 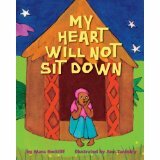 My Heart Will Not Sit Down by Storypath is licensed under a Creative Commons Attribution-NonCommercial 4.0 International License.